Annisquam Herb Farm: Gardening seminars @ Corliss . . . Gardening seminars @ Corliss . . .
Years and years ago I bought my first peach tree, a Red Haven, at Corliss. The advise on pruning (which meant I went home with a trunk and two very short branches!) and how and what to plant the tree in gave my tree a great start. It grow beyond my wildest dreams! I had to leave that one behind. I was able to plant another Red Haven in West Gloucester. It was beautiful. I learned more about keeping the tree healthy with each tree. Corliss is my my go-to plant supplier. More later on keeping the trees healthy. Three years ago I added a Bartlett Pear. 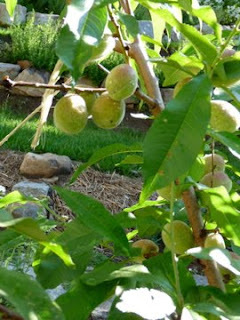 This year I will be adding another peach tree to my new garden. Since the peach trees were sold out when I wanted one two years ago, I have signed up to receive a notice when the trees arrive! It will be an Alberta to add to the Red Haven. Sat. 3/27/10 ~ The Well-Armed Gardener: Since - a little knowledge is dangerous We’ll provide all the basics needed to succeed with lawns and ornamentals . . . stressing the importance of prevention, diagnostics and clean maintenance. If you are interested in more information or want to sign up for The Well-Armed Gardener, Ms. Lambert's blog is Garden Author. You can sign up for her Newsletter there too!